Just after 2011 roared to a close here in our home neighborhood the East Village, we paused to remember the high points and firsts of the year. Thanks to our audiences both long time and new, THE JACKIE FACTORY enjoyed producing another epic year of shows including NIGHT OF 1000 STEVIES 21, LOW LIFE 5: FLAMING QUEENS at the HOWL! 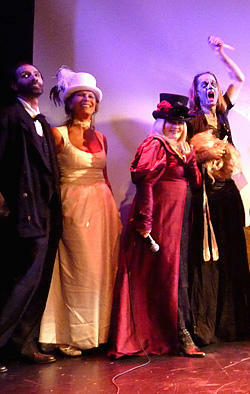 Festival, and GHOSTLIGHT, our Halloween benefit for the ACTOR'S FUND at THEATRE 80 ST. MARKS. Photo: GHOSTLIGHT bows for (left to right) Paul Alexander, Editrix Abby, Chi Chi Valenti and Flloyd - photo by MARK TUSK. Last January we moved our two online communities (born in 2001) to this great new platform - hoop.la - that allows all manner of social sharing. The nightclub-centric MOTHERBOARDS (where you may be reading this on a freezing cold evening) and the NYC drag/transgender boards at QUEENMOTHER.TV started giving service alerts on twitter @motherboardsnyc during the move, and now regularly tweet important news from the boards as well. 2011 also saw the birth of the JACKIE FACTORY's new digital label ENDLESS NIGHT MUSIC (distributed by THE ORCHARD), with its first releases by ERICKATOURE AVIANCE, SADE PENDAVIS and PAUL ALEXANDER and PRINCESS XTRAVAGANZA. All things considered, a very good year indeed. Thanks to the hundreds of collaborators, posters, performers, thinkers and dancefloor geniuses who helped along the way - we promise you much more in 2012.